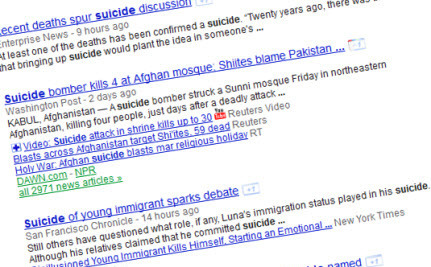 There seem to be a lot more suicides in the news these days. There are also a lot more murders, kidnappings, earthquakes, tornadoes, and environmental disasters. It is hard to tell whether these events are, in fact, increasing in frequency or if the rapid and global nature of news dissemination just means that we hear about more of them. In the Globe and Mail, Steve Ladurantaye wrote about how the taboo against reporting on suicide met its end. He wrote about a scenario two years ago, where the new editor of the Ottawa Citizen sent reporters out to attempt to interview families of suicide victims. In the story they wrote about one victim, they included the victim’s name, used the word “suicide” prominently, and chose details and language for the story that had the effect of sensationalizing it. Ottawa Citizen editor Gerry Nott argued that with so many young people dying of suicide, it was critical that they report on it, just as they would if there were a significant rise in mountain biking deaths. Canadian newsrooms have been averse to covering suicides for decades, deferring to medical studies that suggest publicizing suicide results is “contagion” – the idea that stories about young people killing themselves lead to more young people killing themselves and should be avoided. In the past few years, most news outlets seem to have left the taboo behind and are following Nott’s lead. Some argue, however, that this isn’t the best approach and that any reporting on suicide needs to be done with extreme caution. Mental health experts believe that excessive and insensitive coverage of suicides (including alarming statistics, glorifying profiles of the deceased, and pitying tone) inspires imitative behaviours (known as “suicide contagion”), and re-enforces stigma surrounding mental disorders. To ensure that media avoid counter-productive coverage, major health agencies worldwide, including the Canadian Psychiatric Association, regularly release guidelines for media. They recommend press reduce suicide reporting overall; exclude information on suicide methods; avoid implying that suicide is “caused” by any single factor or event (such as bullying), and keep the word “suicide” out of headlines. The Canadian Psychiatric Association’s Media Guidelines for Reporting Suicide note that “there is a significant evidence-base demonstrating that media reporting of suicides is linked to copycat suicides among youth and young adults under 24 years of age. The guidelines suggest things to avoid and convey when writing about suicide. When the news media was restricted to trained journalists, ensuring that these guidelines were followed most of the time may have been possible. However, in the age of social media where everyone and anyone can share news with others and where traditional media outlets are competing with non-traditional media for eyeballs, these guidelines are less likely to be followed. People look to their own online networks to express grief over suicides in their own circle of friends or community. People converse with others on facebook or twitter in an attempt to find answers. People want to create awareness about the conditions that sometimes contribute to suicide. People do all of this, and more, without necessarily understanding the negative impact that it can have. Among my own peer group on twitter, I’ve experienced two suicides and two attempted suicides within the past year. In the short span of twelve months, that effectively triples the number of suicides and attempted suicides that I have been exposed to among my peer group in my entire life. That doesn’t even begin to incorporate the number of additional suicides in my community and around the world that I have seen reported in the news or that I have even been involved in reporting on. I’m thankful for the two friends who are still with us because our community jumped to action when they posted their suicide notes online. I’m thankful for the help that they have received and are still getting. I’m thankful for the many people every day who find the support that they need from friends online. I’m thankful for all of that, but telling their stories is more difficult than telling the stories of the deceased because of privacy concerns. If others are seeing a similar increase and if reporting on suicide does truly lead to an increase in suicides, what can we do to stop it? People are, after all, just acting as human beings and not as trained journalists. Personally, I will take the guidelines provided by the Canadian Psychiatric Association to heart in terms of my own writing, both professionally and personally. Will you? I think part of the contagion effect simply lies with the fact that when a suicide occurs, people have a tendency to start posting images and messages about the individual, and how important that individual is. To anyone going through depression/suicidal ideation, that's the one thing they need, and are not getting. It creates the idea that "if I kill myself, then people will care about me". I do question if this excessive talk and love for someone who commits suicide, does lead to further suicides for that reason. We need to care about people more in life, not in death, by the time there is death, it's unfortunately too late. As conditions on this planet worsen at an increasingly fast pace, suicide should become exponentially more common. When extinction becomes unavoidable, personal extinction becomes the one means of controlling how one's life ends. I'm not sure there is a way to handle this problem. Most kill with secrets dying with them that we will never know. It is a sick thing when children think this is the best thing to do when things get so awfull they have these thoughts that make them want to kill themselves. Even in the best of families this will happen. While I would not want it all over the news if I did this it is sick when people do so for attention they will never see at the end because when you are dead it is to late. oops too much to say cont. Sorry Michael im not trying to hurt you mate, but i reckon its fair I respond. Stigma-a mental or physical mark that is characteristic of a defect or disease: the stigmata of leprosy.the stigma of mental illness. Ie:"Mental" is the stigma itself, it says mad, insane ,lunatic, crazy, crackers, loony.etc and unfortunat­ely it doesn't just say it to the tagged person, it also says it to their friends, and family, as well as the community, and thats hurtful to the victim. Addressing why, is what were doing here, right now. The lid is to stop others following a trend. Mental health, and talking about them in media, and every day,unfortunately promotes that. Any caring person will always need to listen to, and answer any concerns anyone has. Thats why we care, and thats why we have counselors, and psychologists, to also help with that care.Ever gone shhh not in front of the kids, cant let the kids hear.Thats what this is about,its not about denial, its about what constitutes care, what care is, not just to some. Drug users are the same as everyone else, they commit crimes because of their addictions, and because they are bad buggers like anyone else who harms or hurts others,and they're not to be pitied, but treated like anyone else who hurts others. I have wonder about this for a long time now. It seems that one is always followed by two or three more that we read about. How many are not reported to the press? Statistics and learning about bullying and suicides for whatever reasons should be reported on, individual suicides should not, especially teen suicides where the possibility is there for more to follow. It seems our younger generation has a morbid relationship to fame. I'm not saying the youth who have committed suicide are fame seekers, indeed many of them were very troubled and beaten-down souls. I am saying since we know reporting teen suicide can have a ripple effect we should err on the side of caution. A spate of suicides a few years ago in South Wales saw young people follow one another in trading their lives for the ersatz fame of becoming the subject of sentimental in memoriam tribute pages on social networking sites. Sad indictment that the fetishisation of celebrity can lead to posthumous fame being regarded as better than a life lived without any fame whatsoever. These youngsters were not driven to take their lives out of any sense of despair but rather, perhaps, a despondency arising out of unrealistic expectations from life. Publicity did provide the engine but it was entirely self-generated in this and other instances, such as with the Japanese suicide pact sites. Not sure what you mean by "stigma." Could you explain more specifically.